Product prices and availability are accurate as of 2019-04-20 10:47:32 EDT and are subject to change. Any price and availability information displayed on http://www.amazon.com/ at the time of purchase will apply to the purchase of this product. 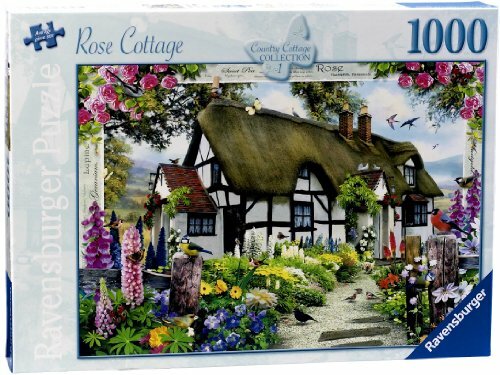 Rose Cottage is the first in a series of puzzles depicting idyllic cottages and gardens. An ancient timber framed thatched cottage nestles in the beautiful British countryside. 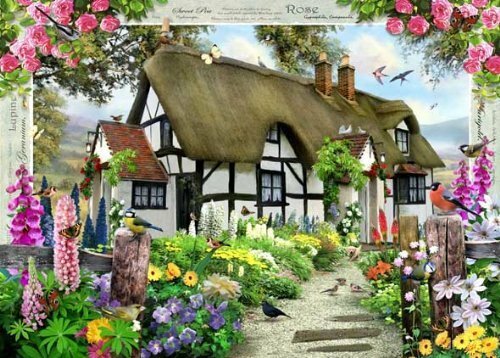 Roses wind their way around the doorways, and the garden is packed with beautiful flowers including foxgloves, lupins, geraniums and clematis. A wonderful gift or pastime for anyone who loves gardening or the countryside. Comes packaged in a sturdy box which shows additional puzzle picture on the box base for additional reference. Number 1 in the "Country Cottage" collection of puzzles. High quality 1000 piece cardboard jigsaw puzzle. The finished puzzle measures 70 x 50cm when complete. Suitable for ages 12 years and up. Made from strong premium grade cardboard, with linen finish print to minimise glare on puzzle image.